Canada ranks highly in global comparisons of public administration, even though the country's administrative structure is known to be extremely complex. In terms of leadership skills and knowledge creation, this creates challenges but also highlights strengths. Renewing the management and leadership of society, public administration and state institutions means working together. Most sectors of public policy have their own networks and communities which, at least to some degree, share a common image of reality, an understanding of the problems to be solved and the ways in which to solve them. These kinds of epistemic communities have emerged as one of the responses to the complicated nature of managing change within the context of the state and its administrative mechanisms. Canada is an example of a multi-level polity: its form of government is that of a federal constitutional monarchy, comprising no fewer than ten provinces and three territories. The multifaceted nature of its administration is a complicating feature, though it also brings strengths in skills and knowledge: negotiating skills tend to increase when the backing of a majority is required for decisions at the federal level. “Governance becomes difficult, when there are so many (regional) governments”, noted one top-level government civil servant we met during our study tour. Defining the tasks of the state administration takes place at the ministerial level, with mandate letters from the Prime Minister, in a somewhat similar manner to our neighbouring country Sweden. The principles the current prime minister has emphasised in his mandate letters reflect quite closely those found in our own domestic agenda: innovation, entrepreneurship, openness and transparency. We came across numerous examples of innovative public administration. An Impact and Innovation Unit manages the Impact Canada initiative, in which societal renewal is based on outcome–based action models. The tool kit includes items such as innovation and partnership funding, impact evaluation, result-based funding models, and behavioural science experiments. Sound familiar? Civil servants are offered training and tools in experimentation skills, innovation clinics and – perhaps most important of all – the strategic “whole of government” (WoG) agenda shared by the entire state administration, on which to build. It is no wonder that Canada was, yet again, seen in a recent OECD ranking as the country in the forefront of public administration. Innovation can be found in many places. Canada’s national statistical agency has for instance clearly taken seriously the challenge of opening up data and reforming the knowledge base. This is both about the transparency of data concerning the citizens and its use, as well as new methods of collecting information. An interesting example here is the crowdsourced data production of national accounting. Canada is set to legalise cannabis in June 2018. In order to understand the market value and economic impact of this previously illegal commodity in GDP terms, Statistics Canada launched a crowdsourcing process to understand the impact of the phenomenon, something which Canada’s citizens have enthusiastically embraced! Canada’s statistical authority recently carried out an open survey receiving responses from 15,000 citizens on the purchasing, use and pricing of cannabis. During our study tour we met Elissa Goldberg, who works at Global Affairs Canada as an Assistant Deputy Minister and “innovation champion”. Elissa’s area of responsibility involves partnerships and development policy innovation. In her view, innovation and entrepreneurship go hand in hand: an entrepreneurial mode of action and courage are preconditions for merit and progress in a civil servant’s career. Innovative administration is reinforced in practice by offering civil servants in the foreign affairs administration significant funding for experimentation, training in experimental skills and participation in innovation clinics. When we looked at the manifold and multi-level factors of the Canadian system from a helicopter perspective, the song by Joni Mitchell quoted at the beginning of this blog came to mind. The song was actually written the year that Sitra was established – an interesting coincidence in itself! Finland and Canada share many characteristics which explains why both countries constantly perform well in international comparisons of different types: good quality of life, accountability, equality and social cohesion, the country’s large size in proportion to the size of its population, bilingualism, richness of natural resources… No system is perfect, but both countries appear to be promising candidates in their attempts to forge renewal – and to be seen as global leaders in this activity. Ultimately, rather than the many different practices, excellent tools and outstanding administrative methods, the enduring impression gained from our trip was of a sense of a commitment to ‘getting things done’ – a shared ethos for sure. Despite the potential problems arising from a complex administrative setup, the goal seems to stay more clearly in mind when there is shared enthusiasm and belief: In the words of the slogan of the 150th anniversary year of the Canadian Confederation, ”the world needs more Canada”. A comment by Peter Vesterbacka of Angry Birds fame inevitably comes to mind: how strange it is that Finland, which basks at the top of international comparisons, does not achieve more inspite of its demonstrable excellence. Perhaps we should learn something from Canada. Perhaps the world could take a little bit more of Finland too? 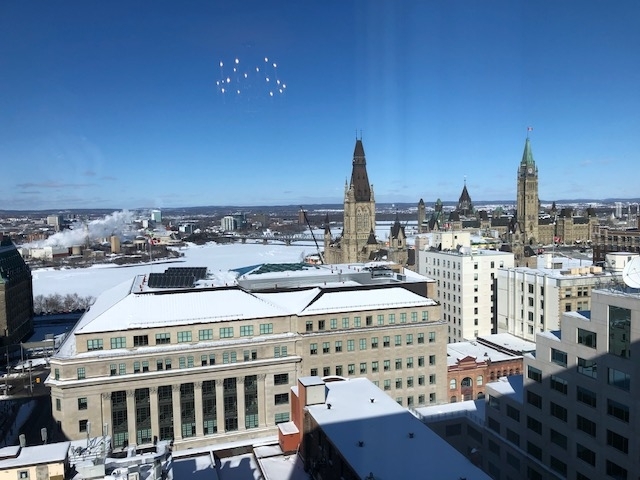 Kaisa Lähteenmäki-Smith and Petri Virtanen of Sitra’s Public Sector Leadership project were inspired by their study visit to Canada in early February, 2018.